What’s going on everybody!? Welcome to another edition of Axe of Creation. 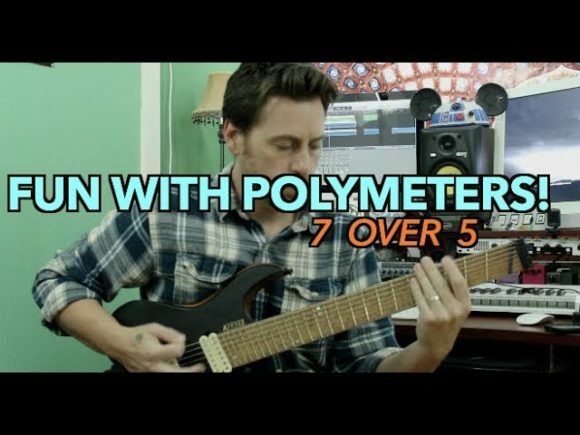 In this week’s lesson, we’ll be having a little rhythmical fun by exploring polymeters. One way that we can have fun creating some Odd Time effects is through the use of Polymeters. In this example, we’ll be playing in 7/8 but really all we’ll be doing is playing a repeating chug rhythm (of 5 notes.) Now are hits are as follows; 1 Rest 3 4 Rest. Now, 7/8 can be difficult enough to play over let alone playing a repeating 5/16 pattern underneath it. So because of that, I wanted to keep the riff as simple as possible, with so much going on time-wise, we wanted to keep the foundation simple and powerful. Plus, we can always layer ideas over it, hint-hint! Essentially, we will be repeating the pattern of 5 eight times, and on that eighth time, we need to manipulate it a bit to make it turn around so we add a small extension note. Notice how I turn the single notes into power chord, just to add emphasis and feeling. 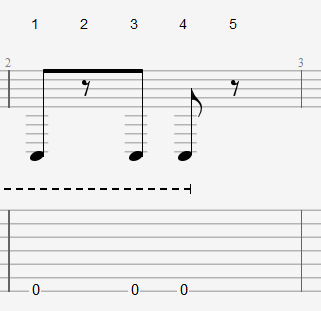 Later this month, we will be looking at a couple of ways we can build song idea and layer melodic ideas! As always, let me know what you come up with and I’ll see you next time!